Hostwinds is a company that provides hosting services to a diversified client base that ranges from small bloggers with a single website to Fortune 500 companies. Find out how they chose MailChannels Dedicated to clean up their spammy reputation. 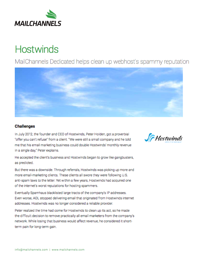 Read how Hostwinds went from having a bad reputation for hosting spammers to a “no-SPAM tolerance network” designation from Spamhaus.